See the new DEROS HERE! 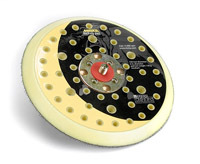 Only half the size and weight of traditional electric finishing sanders, CEROS incorporates a powerful brushless DC motor that is smooth, quiet, and maintenance free. CEROS is available in both 5" and 6" models, and uses standard backing pads with a 5/16" threaded mount. CEROS features digitally controlled variable speeds from 4,000 to 10,000 rpm to provide the ideal finish for a variety of applications. Complete with Systainer storage case, power supply, cords, wrench, user manual and quickstart DVD. External, Universal Power Supply means lightweight, ergonomic sander! Fits common 5/16" Threaded Backup Pads instead of proprietary styles like other brands. User Manual & Quickstart DVD included. The CEROS System is packaged in a durable Systainer for easy handling and storage. 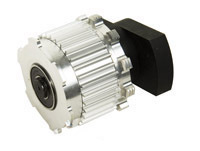 CEROS uses a brushless DC motor for improved efficiency and power. The 400 watt motor is more powerful than its competitors, in Half the Size! Unlike Competitive sanders that use expensiv, proprietary backup pads, CEROS uses an industry standard 5/16" threaded attachment. 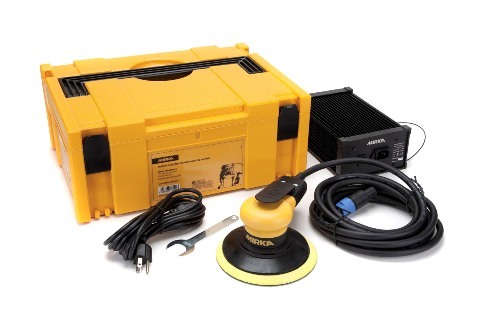 This allows the sander to be used with a variety of hook & loop as well as vinyl-faced pads! 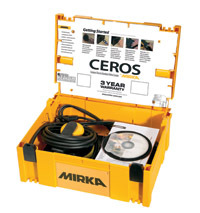 CEROS has a 4 meter (12 foot) power cord from the transformer to the tool. 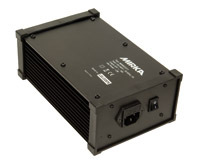 This allows you to place the power supply in a convenient location away from your work. The CEROS transformer converts AC voltage to DC, removing bulky weight from the tool!